Dr. Aye Kyaw has written books on education and culture in Burma. He was born in Lwe Chaung village in Taungok Township in Arakan State. 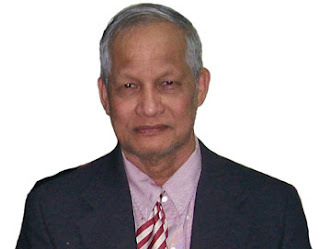 He has a BA in history and religion, an MA in Asian history and a BA in law from Rangoon University. He earned a Ph.D in Southeast Asia History at Monash University in Australia. Dr. Aye Kyaw taught at universities in Burma, Thailand and the US. Now retired, he lives in New York city. While visiting Bangkok, he was interviewed by Ba Saw Tin on his views on Arakan history, politics in Burma and the debate over Rohingya history and their troubled relationship with the Burmese military government. Question: Describe Arakan politics before Burma's independence? Answer: Arakan leaders always joined in Burma's struggle for independence. They participated at the forefront in the struggle against British colonial rule and the Japanese invasion. If someone asks why they participated, it was because the Arakan wanted to rule themselves. The prominent Arakan leaders during British rule were Monk U Seinda, monk U Pyinnya Thiha, U Nyo Tun, U Aung Zan Wai, U Kyaw Min, U Ba Saw and others. These leaders were prominent figures in the Arakan resistance movement and Arakan politics. Monk U Ottama was one of the first leaders in Burmese politics. If you look at the situation of the Arakan under British rule, there were two groups. One group worked with the British, and one group joined in the independence struggle led by Gen. Aung San. U Nyo Tun was a famous student leader in the 1936 student strike, and he was quite well-known in both the Arakan and Burmese community. While Burmese acknowledge March 27 as marking the beginning of the resistance movement against Japan, the Arakan had already started their resistance against Japan earlier, around Feb. 12 or 13. Q. What happened to the Arakan after the independence struggle? A. The main reason they fought was to get their own state and self rule. Unfortunately, when Burma won independence, nothing came of it. They asked Prime Minister U Nu to grant them a state, but U Nu evaded the issue. Q. How did politics development during the following years? A. During U Nu's Anti Fascist Peoples' Freedom League (AFPFL) rule, there were two powerful political parties in Arakan State: The AFPFL and the Arakan Unity Party (AUP). U Kyaw Min led the AUP. U Aung Zan Wai and Taung Koke U Kyaw Tin led the AFPFL in the Arakan region. Then the AFPFL split into two factions: the "stable" AFPFL and the “clean” AFPFL. The clean AFPFL faction leader, prime minister U Nu, set up Mayu District in Arakan State. He registered Bengali as citizens through national registration and allowed them to vote. During the Colonial era, the Bengali started coming into Arakan to work. They mostly worked in the agricultural sector, and then returned when the work was done. One of the prominent leaders among Bengali was Sultan Mahmud. The AFPFL was weak in a sense. When U Nu allowed Bengalis to enter Mayu District that was the beginning of today’s Rohingya problem. Q. Do you know when the use of the term "Rohingya" began? A. I think it appeared during the 1960s. Because even the Bengali leader, Sultan Mahmud, when he became a member of parliament, I don’t think he used the word "Rohingya." In earlier Burmese history and in Arakan history, I haven’t seen the word Rohinhya. Even after independence, there was no such word. Q. What does "Rohingya” mean? A. When Sayagyi U Tha Tun was in good health, we visited whenever he was in Rangoon. We had conversations on several themes: literature, history and other social matters. Once, he explained to me the meaning of Rohingya. The word derived from an Arakan word, Lwintja. Lwintja in Arakan means leaves falling from trees and blowing around without any purpose. The word basically means anything or anyone wandering around without a cause. I analyzed the word in the linguistic sense, and I once wrote an academic article in the Pyinnya Padesa journal, published by Rangoon University. Q. Nowadays, many Arakans see the Rohingya as a threat. Why? A. The underlying reason was the emergence of the Mujahids, who started an armed insurrection in Arakan State to try to acquire their own land. Originally, they were Bengali from Bangladesh. In earlier days, they came to work in Arakan and returned to their homes when the work was done. Then they faced difficulties living in Bangladesh because it was so crowded. Afterward, the Mujahids attempted to set up a Muslim State in Buthee Taung, Maung Daw and Yathei Taung townships of Mayu District, where U Nu had granted them the right to live. When the Mujahids began to prosper, the Arakans didn't accept the idea. The Arakans see them as a danger, threatening their land, national identity and religion, and that is why the Arakans are so allergic to the word, Rohingya. Q. What is the background situation of Rohinja's emergence? A. That is a good question. The Rohingya issue is just a problem on the surface. The underlying problem is the idea of "Islamization" and the expansion of Islam. The Rohingya movement is funded by countries in North Africa and the Middle East. These countries have donated large amount of money and weapons. In Southeast Asia, organizations in Malaysia support them. They support the expansion of Islam. They operate as “Burmese nationals” and “Arakan citizens” by using the name of Rohingya. Actually, Rohinja are not a race, and they are not Burmese citizens. Q. The Rohingya are not acknowledged by the military junta as an ethnic nationality in Burma. But the Rohingya are seeking a position on the Ethnic Nationalities Council (in exile). The Arakan representatives oppose them. How do you define an ethnic nationality? A. In 1978, while under the Burma Socialist Programme Party rule, me, Dr. Maung Maung (the late President), and U San Thar Aung discussed a law on ethnic nationality. Dr. Maung Maung was an academic on law, I am an historian and U San Thar Aung was director general of the higher education department at that time. We discussed the matter in a room in the State Council office. I said that for recognizing an ethnic nationality in Burma, there was a census record during the Bodaw Phaya reign, made in the 18th century. It listed all nationalities living in Burma, and it mentioned Arakans, Karens and Mons (Talaings) in the survey. The document can be taken as a base, I suggested. Dr. Maung Maung said that survey was too early. Then I suggested the year of 1824, a turning point in Burmese history when the British annexed lower Burma. Dr. Maung Maung agreed on that date, and we drafted a law that people living in Burma during 1824 were recognized as ethnic nationalities. We found no such word as Rohingya in that survey.